What is Space Junk? – Should we be Concerned? - Which Sat Nav? 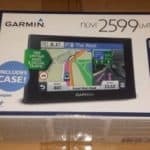 Home » Sat Nav » What is Space Junk? – Should we be Concerned? Space exploration is an unbelievable achievement for mankind. The ability to land on the moon really is the stuff of science fiction. Using satellites that orbit the earth in order to find a restaurant is a triumph of technology. These are all fabulous accomplishments in their own rights and they have undoubtedly made our lives easier. As a result of these advancements however there are potential problems arising. These problems may lie many hundreds of kilometres away from the surface of the earth but, there is most certainly an issue that has begun to cause a number of scientists concern. The problem relates to space debris. In this series of posts we are going to take a look at space junk. What is space junk and is it something that we should be concerned about down here on earth? And what, if anything is being done about it? Take a look at the image on the right provided by NASA. The white dots that you see surrounding the planet depict orbital debris or space junk. It’s pretty scary to think that all this rubbish is flying around the planet, right? So what exactly is it and how did it get there? Ever since the launch of the first satellite into space, the Russian satellite Sputnik 1 in October of 1957, man has continually explored space. In the process of doing so however, a huge amount of debris has been left behind in the orbit. 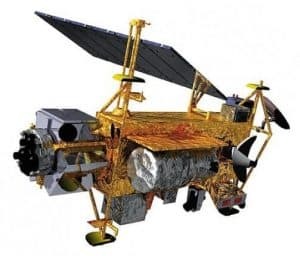 Satellites – once a satellite has reached the end of its life cycle it usually remains in orbit albeit they are required to move further away from the planet. This should ensure that they don’t affect the ‘younger’ satellites that are still in operation. Space Craft – parts may have become detached and drifted away. Spent rocket boosters or stages drop away from the space craft as it climbs up into the atmosphere. The breaking up of these stages has contributed to much of the debris that floats around in the orbit. Astronaut Tools – a number of items have been left behind over the years by space explorers. There have also been a number of items accidentally drifting away – take a look at the video above to see how easily it happened to Heidemarie Stefanyshyn-Pipero. 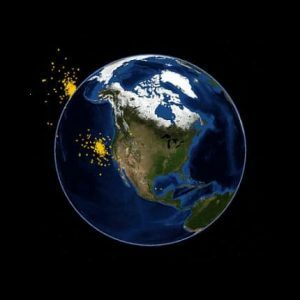 Collision Debris – with all of the junk that is floating around in space it’s inevitable that there will be some collisions. When two items collide at high speed the impact creates more space junk as parts and fragments break away. This results in many more smaller pieces of debris flying around. Natural Debris – consisting of natural particles such as meteoroids. In reality however, these meteoroids tend to orbit the sun rather than the Earth. How fast does the debris travel? 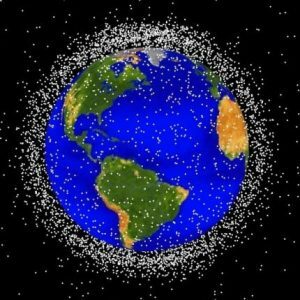 There are millions of pieces of debris orbiting the Earth. They vary in sizes and most of them are so small that we are unable to track them. They do however travel at phenomenal speeds – it is estimated that they travel at a speed of around 28,000 kms per hour. Any impact whatsoever at those type of speeds will as you can imagine, cause huge amounts of damage to whatever they hit. The concern is that they could potentially hit working satellites or even space crafts. With all of this junk floating around at high speeds surely then, there must have been lots of big collisions up in space? Well, surprisingly there have been very few dangerous collisions. There have been a number of lesser collisions. Do you remember the following collision reported in the news in early 2009? 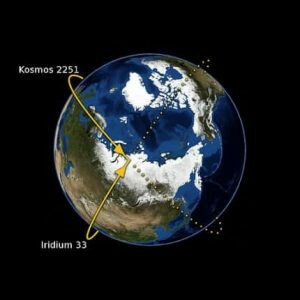 The dead Russian Cosmos 2251 satellite crashed into a working US satellite Iridium 33. The crash took place over the northern part of Siberia at a distance of around 800 kilometres away from the surface of the Earth. NASA estimated that this one collision alone has produced an additional 1,000 pieces of debris larger than 10 cms. Take a look at the two reconstruction diagrams below. You can see the trajectory the satellites took immediately prior to the point of impact. The second diagram depicts the debris fields only 20 minutes after the impact. The distance travelled by the debris fields in such a short space of time show that the impact took place at extremely high speeds. Should we be concerned about space junk? Ok, so we know that there is a lot of junk flying around up there. We also know that the debris crashes into one another. However, all of this happens hundreds and thousands of kilometres away from the earth’s surface. Why then should we be concerned? Well, because this debris falls back to earth on a regular basis. In fact, NASA have catalogued on average, one piece of debris re-entering the Earth every single day for the last 50 years. In other words, space junk falls to earth all of the time! Amazingly there have been no reports of people being seriously injured by this falling debris. Most of it drops into one of the world’s vast oceans or in remote places like the northern parts of Siberia. The main reason however, is that the debris burns upon re-entry into the earth’s atmosphere. Most of the debris does not survive this processing the parts that do are substantially reduced in size. NASA’s Upper Atmosphere Research Satellite (UARS) was launched into orbit in September 1991. Its mission was to monitor the Earth’s ozone layer for a period of 3 years. UARS remained in service for a total of 14 years and didn’t stop working until late 2005. Once decommissioned it was moved out of the way of the younger working satellites but remained in orbit. Over time UARS lost altitude slowly and began to drop towards the Earth’s surface. Eventually gravitational pull took over and the satellite re-entered the atmosphere. Now, you may ask why are we highlighting this particular piece of debris as being significant? Purely because of the size of the satellite. UARS measured a massive 35 feet in length and around 15 feet in width. It also weighed a huge 6.5 tons. If you think about it, that’s a massive bit of junk to be falling from the sky. It’s frightening to think that it could potentially fall onto your front lawn! NASA however have calculated that the possibility of this happening is very slim – about 1 in 3,200 apparently! Most of the satellite would have been destroyed when re-entering however it is estimated that about half a ton would have survived the descent. That’s still going to cause a pretty big splash somewhere in the Pacific Ocean! Click here to read NASA’s Final Update on UARS re-entering the earth’s atmosphere. If, most of the debris disintegrates upon re-entry and most of it lands in remote areas of the planet, why then should we be concerned? The more pieces of debris that flies around in the orbit then the higher the chances of collisions. This means that the number of junk increases as parts disintegrate and or break away. This will cause more pieces to eventually fall back down to earth but, more wrongly is that it will cause damage to the younger working satellites. These satellites are an integral part of our lives and we place a huge reliance on them. 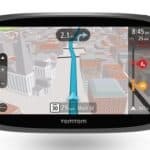 The satellite navigation systems in our cars is but the tip of the iceberg. Civilian flights rely on these systems to stay on course and it’s vital for the military to have the capabilities to conduct operations accurately and as safely as possible. So, it won’t just be our ability to drive to the nearest supermarket that will be affected. Another, potential problem that may arise in the future is that if the amount of space junk continues to increase at the rate it is then, we may not be able to get off our planet. It may become too difficult and too dangerous to manoeuvre a space craft through the debris. We may even inadvertently trap ourselves on this planet by not cleaning up our mess. At the very least we must ensure that we prevent any further unnecessary debris being deposited in the orbit. In future posts we will be looking at what steps are being implemented in order to prevent any further space junk being deposited up there. In the meantime, let me know if you have any comments or questions in the box below. It would be really cool if on of our readers has come across a bit of space debris on their font lawn! It is actually quite scary to see the amount of space junk floating around our planet, and I didn’t realize there was so much debris! WOAH! The parts certainly do travel at some crazy speeds, and I certainly wouldn’t want to be in the path!! I’m actually glad that the parts do burn up as they enter Earth’s atmosphere because I’d hate to imagine them hitting towns and cities. We would all be scared to go outside, lol. I have always been interested in Space, but the thought of Space Junk hadn’t crossed my mind. It’s unbelievable to see so much of it it NASA’s picture…. Incredible!! Just imagine how much time, effort and money the world has invested in to all that debris flying about? $HUNDREDS OF MILLIONS or perhaps $BILLIONS?! There is one good thing though…. Perhaps the debris could protect Earth from being invaded by other worlds? LOL. This is a very interesting and informative article. I don’t like the odds of that satellite hitting a populated zone. I have a lot less change of winning the lottery, which is most unnerving. I knew that space junk was a problem, but I didn’t realize that a piece fell every day. As you say, some of these pieces could be huge, and I guess the risk increases as more and more satellites become decommissioned and start floating back towards the earth’s atmosphere. we need some sort of orbital hoover. Where you would empty the bag is beyond me though! WOW! I always knew that there was debris in space, but I thought that it just re-entered the atmosphere and burned up on re-entry. After reading your article, I now am quite concerned. The speed at which it travels is also upsetting. To think that our navigational instruments could start malfunctioning. I sure hope that they start thinking about cleaning up the space junk. This is very interesting. Didn’t know all this space junk was just polluting are area. The first thing I thought about when I seen all those white dots around Earth was how are we able to get out with all that junk around. But you said it is going to be a problem in the near future. It seems like it is a problem now. They need to do a cleaning mission. Amazing site! Everything you always wanted to know, but didnâ€™t want to ask! I really am shocked at how much rubbish is flying around our planet! I always have been a space buff, used to love the Tv show on SKY simply called space. Used to have great pictures and videos to music, anyway enough of that! I really love this site! So much info on here, I just want to read it all, and so well presented, well done. Great content, and very well explained, and documented. This is defiantly getting book marked on my browser for future reading. Love it. Wow, I don’t know whether to be amazed or concerned about all of that junk up there. It’s amazing that in the relatively short amount of time that we’ve been traveling to space. I wonder how many decommissioned satellites are up there that have been destroyed by debris? This was a very interesting and informative article. Thank you for posting this. dude, I never thought of how much stuff is floating around up there. Now reading this it totally makes sense that stuff could come back into our atmosphere at any time- frightening! I have heard stories of huge meteors coming crashing down and making quite a bit of damage though. This was an eye-opening article. I knew that there was a lot of junk in orbit around the planet, but enough to deter a spacecraft from exiting Earth? That’s pretty mind boggling when you think about it. I’ve read that the small shards of debris can cause a lot of damage and could probably even damage an astronaut’s suit. It is amazing to me how much space junk humanity has managed to generate.